Added by Indo American News on March 5, 2015. 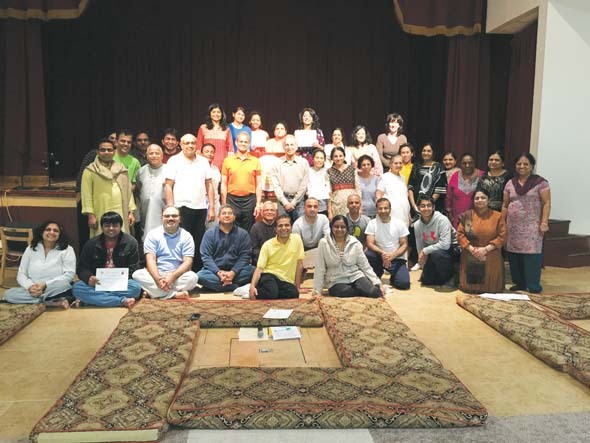 HOUSTON: The Patanjali Yogpeeth (USA) Trust organized a Self-Development and Assistant Teacher program at Arya Samaj, Houston on schiller Road. It was a three day Training program which took place on Feb. 27, 28 and Mar 1. Patanjali Yogpeeth has been founded by Yogrishi Swami Ramdevji who is instrumental in spreading the knowledge of Yoga thought the world. This session integrated Yog-asanas, pranayama, meditation, mudras, bandhas & self-reflection. The renowned president of International Association of Yoga Therapists (IAYT), Dr. Dilip Sarkar and Houston’s Yoga-guru, Shekhar Agrawal were the teaching coordinators. More than 40 participants attended this program and were blessed by Dr. Dilip Sarkar’s divine presence. This training took place almost after 6 years and was an attempt to spread Swami Ramdevji’s message (Good Health is the Birth-right of all Human Beings) to the world. In today’s uncertain world “Yoga is the answer to human worries and miseries. Yog teaches how to live a healthy life through the medium of Asanas, Pranayama and meditation. The program taught Asthang Yog practice to the disciples. Sage Patanjali’s eight principles of Yoga was the main theme and Acharya Surya Nandaji of Arya Samaj beautifully covered Patanjali’s Yog Darshan. The program also involved Ayurveda, Mudras, acupressure and the Six Cleansing Kriyas (which includes Jalneti, Sutraneti, Nasya and Vaman dhauti). The trainers are accomplished yogis who demonstrated various asanas and pranayama with ease and elegance. They emphasized on chanting of mantras and concentration of mind to achieve oneness with the universe. The participant’s also got a chance to attend the routine Havan at Arya Samaj. At the end, Shekhar Agrawal stressed on spreading yoga to the whole world and overcome the difficulties of western world’s limited understanding of it. Dr. Sarkar said, “Yoga is not just stretching and bending, it is union of body, mind and spirit to transform Rogi (Diseased) to Yogi (Supreme human being). The session was concluded by a lecture on 7 Chakras in our body. It was fascinating to know how the ancient philosophy of chakras is connected to the understanding of today’s medical science. Dr. Sarkar also presented the valuable pictures of the babies doing yogic asanas in natural poses. He remarked about Indian yogi’s (like Charak and Sushruta) deep understanding of the mental and physical body thousands of years ago. Some of the participants were physicians who gained the miraculous knowledge about evidence based yoga practice. Best of all, the participants were blessed by Swami Ramdevji himself as he connected by phone from Haridwar and declared all participants as Yogis and Yoginis. He invited everyone to come to Patanjali Ashram in Haridwar for the upcoming 7-day NRI only Yoga Training Session from March 24. The Indian communities as well as the Americans are indebted to such a knowledgeable opportunity. Houstonians must thank to the organizers and Mr. Shekhar Agrawal for organizing such a valuable event. The new breed of Yoga teachers will continue to spread Swami Ramdevji’s tradition and help yoga to reach masses. 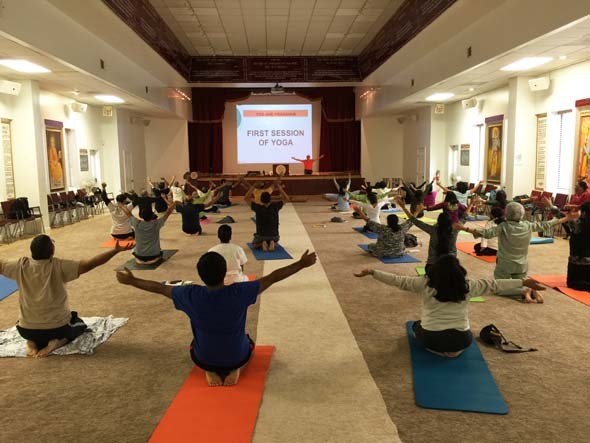 Patanjali Yogpeeth (USA) is also conducting a 3-day yoga workshop from March 6 to 8, 2015 in Atlanta. For further details and classes please visit the website PYPTUSA.org. Mr. Shekhar Agrawal conducts free yoga classes on Saturday and Sunday 8am to 9:30am at Arya Samaj, Houston.